Amid a lack of tangible progress in trade talks between the U.S. and China, growing tensions around the world, as well as slowing economies, some on Wall Street are sounding the alarm that major international brands could soon fall out of favor. And signs are mounting that Canada Goose, the Toronto-based maker of luxury outdoor apparel, could be one of the first to suffer. The company’s stock was downgraded on Thursday to “market perform” from “outperform” at Wells Fargo, which cited valuation concerns, recent weak consumer engagement trends, and significant pressures facing multi-national brands. Wells Fargo also lowered its price target on the stock from $80 to $68. Shares of Canada Goose fell more than 7 percent on Thursday, the stock’s worst day of trading in more than a month. The parka maker’s stock has plunged more than 20 percent from its recent high in mid-November. Wells Fargo added that slowdowns in Google searches and Instagram engagement over the holiday season have sparked further concerns that customers could be pulling back. Since the company’s IPO in early 2017, Google search trends for “Canada Goose” had been increasing at a double-digit rate each quarter but started to decelerate both in Canada and globally late last year. Despite the headwinds, Wells Fargo noted that Canada Goose’s stock trades at a premium to a cohort of global luxury retailers like Burberry, Ferragamo, Moncler, Prada and Tiffany’s. And, shares are still trading more than 160 percent above the IPO price. To compete with other international brands, Canada Goose has been aggressively pushing into China, where the population accounts for one-third of the world’s luxury consumption, according to analyst estimates. The company debuted highly anticipated locations in Hong Kong and Beijing last year, which will compete with local stores featuring knockoff brands. But the apparel maker’s push into China has faced challenges. Canada Goose came under pressure last month as economic and political tensions escalated between China and Western countries. In early December, Canada arrested Meng Wanzhou, the chief financial officer of Chinese tech giant Huawei. 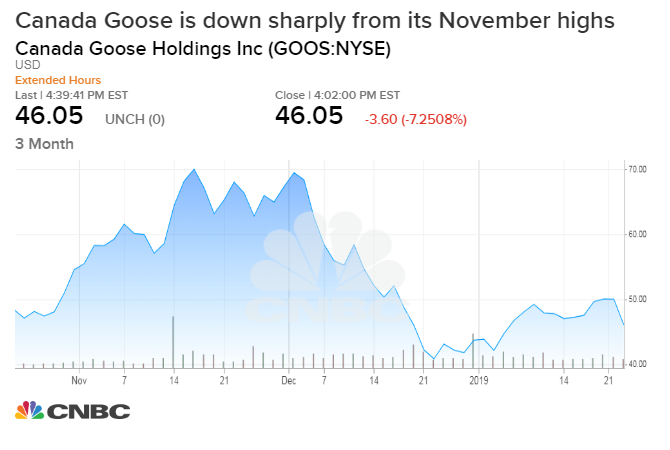 Over the following week, Canada Goose’s stock dropped 17 percent after reports surfaced that Chinese consumers were boycotting the brand. Wells Fargo joins a chorus of business leaders that have warned these ongoing geopolitical tensions could hurt notable North American brands. In early November, Procter & Gamble CEO David Taylor told CNBC that he was especially concerned about the long-term damage the trade war could have on consumer behavior and spending. “What I worry most about with the trade war is it destroys consumers’ confidence in American brands,” Taylor said at the time. In its latest earnings report on Thursday, Starbucks said that stores in China operating for at least one year increased sales by 1 percent this past quarter. But the coffee giant saw transactions there drop by 2 percent, and some analysts worry the company could see a further slowdown if trade disputes aren’t resolved quickly. The U.S. has set a March 2 deadline for negotiators to reach a deal; if no deal is reached, tariffs are set to increase on $200 billion in Chinese goods.